We’d love your help. 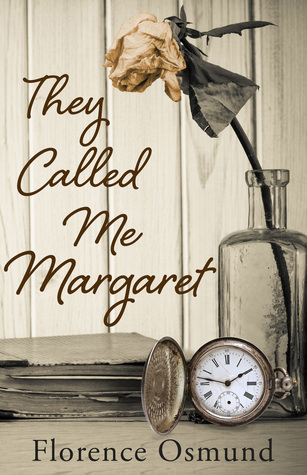 Let us know what’s wrong with this preview of They Called Me Margaret by Florence Osmund. To ask other readers questions about They Called Me Margaret, please sign up. Margaret is a cozy mystery author on the path to opening up her bookstore/coffee shop. Lately, things have begun to disappear, and all around her things seem off. At first, she assumes it is her husband playing out her books, making her feel like she is losing it. What is going on? Margaret is on a path that is strange. She is burdened with an ailing mother in law, her own mother who left her and now reappears, strange acting neighbors, and a less than steady home life with her husband and daught Margaret is a cozy mystery author on the path to opening up her bookstore/coffee shop. Lately, things have begun to disappear, and all around her things seem off. At first, she assumes it is her husband playing out her books, making her feel like she is losing it. What is going on? Margaret is on a path that is strange. She is burdened with an ailing mother in law, her own mother who left her and now reappears, strange acting neighbors, and a less than steady home life with her husband and daughter. All in all, though Margaret is a great character. She is likable and relatable. I definitely can relate to the mother issues because of well moms. Ha! While her husband and neighbors just were not my favorite people, I enjoyed this rollercoaster of a ride. This was not my first book by this author, and I have to say that once again her book was wonderfully written and I can't wait to read more. This is an unusual book, as it seems to flow between genres and styles as the story progresses. We start with a typical mystery setup of mysterious things happening to our title character, and then the disappearance of a neighbour. Gradually the suspense tone lightens as we meet a motley of friends and family with comedic potential – the bitter mother-in-law, the adult daughter out to ‘find herself’, the flighty neighbour and so on. There is even a hint of a potential romantic interest! As you read the book however, the gap between what you are told and what you perceive slowly widens to uncomfortable proportions and the reader is faced with the problem of who to believe when everyone appears to be behaving suspiciously and you can’t trust your own intuition. Because this is not really a ‘genre’ story at all, despite Margaret’s own proficiency in that arena. This is a story about family and about trust, communication and support. It is about aging and parenting, marriage and friendship. The main focus is Margaret herself. We see through her eyes and hear through her ears, but put our own interpretations on events and make our own judgements about who is persecuting her into a state of constant stress. I found the character of Carl particularly baffling throughout the novel – his actions and motivations seemed totally erratic and incomprehensible – however it became clear that this was because Margaret didn’t understand him. No shortage of subtle and clever characterisation here! The ending was unexpected but fitting, and I liked how certain aspects came full circle despite how far the characters had moved on. Even though the story concluded I felt the closing vignette left the door open for the author to revisit Margaret and co at a future point to see how they are all getting on. Earlier in the day, I had nearly lost it when I couldn’t find the pocket watch – one of the few things I’d had of my mother’s – engraved with the words TIME IS A GIFT. It appeared to be old, like maybe it had belonged to someone else before my mother. The previous summer, when my silver bracelet went missing, I thought I must have been careless with it. And then when I couldn’t find the Eiffel Tower Limoges box containing one pearly earring, I figured my memory wasn’t what it used to be. But the third missing item – the pocket watch – caused me to think differently, that either I was losing my mind, or someone wanted me to think I was. This book is tricky to rate as my feelings are mixed. It was somewhat difficult to read because the character was confusing and jumping to odd conclusions but it turns out there was some intention there. But she was difficult to bond with. The blurb in about needs to be worked on as it reveals things too far into the book. But in a way I suspect it succeeded at its intention. The characters never made sense. They didn't seem to follow any real motive or goal. The main character's problems are explained but her husband and neighbors make no sense. And why do we never hear from Lance? Very odd. But I finished it! If I had totally hated it, I sure would not have done that. What a great story. The author was right on the money! I was intrigued and actually lost sleep, as I was reading well into the night on several occasions. I became to involved with Margaret's life, I was thinking of her situation while at work, (don't tell my boss) Thank you Florence Osmund for yet another great book! The author establishes depth for the character of Margaret. This allows the reader to understand and relate to the character nicely. The book flows and reads easily with many struggles and lessons learned as Margaret finds her strength and self-worth. This is an interesting and insightful read. This book was engrossing from beginning to end. There were so many twists and turns, I could hardly wait to pick it up and read the next part. I even learned something about the main characters disease, which I had never heard of. Very well written. It was like I walked into the middle of something and didn’t know exactly what was going on so I waited politely to see if I would get it. My mind went all different directions and I never quite figured out what was going on with Margaret and why. I guess just a day in the life. A good read with a lot of character development. Some parts are laugh out loud funny and others were sad. A lot happens in Margarets life, yet she's a tough one through it all. We are proud to announce that THEY CALLED ME MARGARET by Florence Osmund is a B.R.A.G.Medallion Honoree. This tells readers that this book is well worth their time and money! Quite a few twists and turns! I enjoyed reading this book. It was very interesting. It had a not so much expected ending. I will read more from this author! It was an interesting read and gave an insight about how some authors think. An unusual story line, but still very readable. I read this in two sittings as I really wanted to find out the ending.